Kim’s mission extends beyond just her practice. One of her passions is educating the public about strategic tax planning, revealing the secrets of a subject that had formally only been available to the very rich. According to the U.S. government, every year American taxpayers overpay their taxes by $1 billion due to missed tax credit opportunities. Kim’s mission is to help business owners and professionals keep more of their hard-earned money. Instead of throwing money at the IRS, why not help them invest more back into their own businesses? That’s good for them, that’s good for economy and that’s good for everyone. Many Americans are consistently overpaying their taxes without even knowing it. 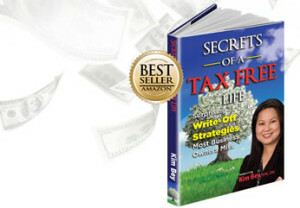 The author of Secrets of a Tax Free Life: Surprising Write-Off Strategies Most Business Owners Miss, Kim has been featured in the Washington Post and other publications. Kim regularly speaks to professionals and business owners on the topics of taxes and tax planning. 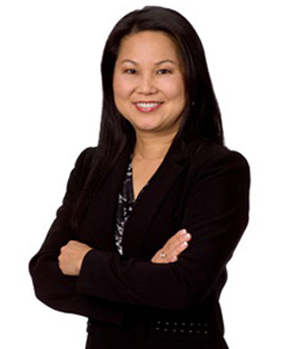 Currently Kim serves on the Practice Management Service Committee of the DC Bar Association, providing DC’s attorneys with expert tax advice to help them manage their own practices. She speaks regularly for the association and is currently providing her expertise in writing their manual for solo law practitioners. 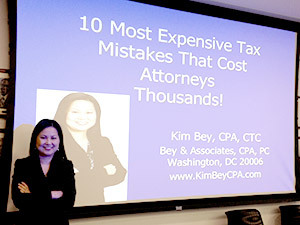 Kim is available to speak on taxes or tax planning strategies to professional associations or other similar groups anywhere in the United States. Whether to doctors, business owners or other professionals, Kim is a highly knowledgeable expert who can clarify and simplify extremely complex subjects. For more information or to request Kim as a speaker or author, please call (202) 483-0404 or fill out the contact form here.